Through the generous support of over 400 local individuals and companies, the 2018 Gowrie Group Challenge was a huge success – raising $160,747 for The Shoreline Soup Kitchens & Pantries (SSKP). 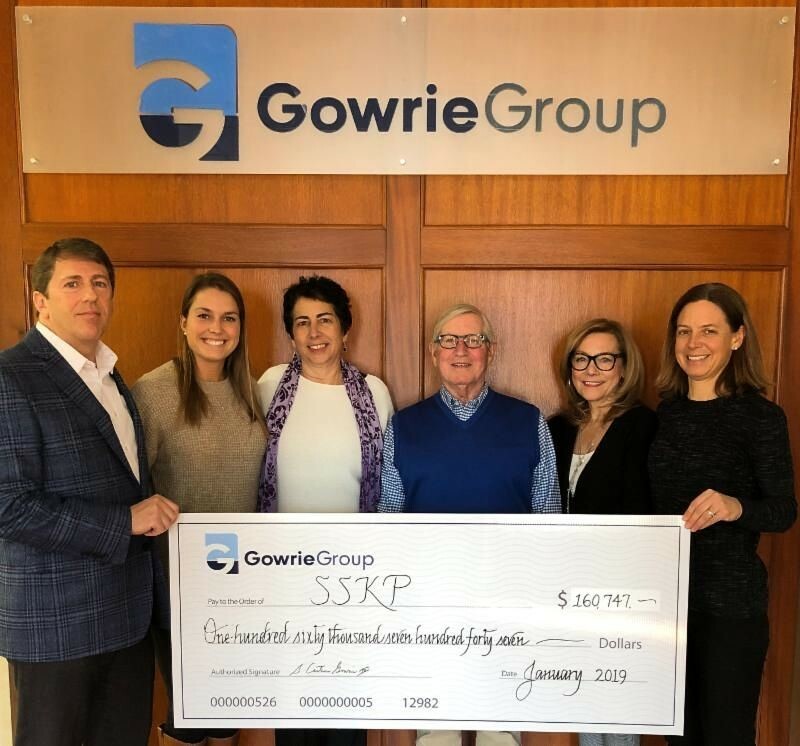 Since Gowrie Group began this challenge in 2004, the challenge has raised over 1.6 million dollars for the SSKP, which equates to providing over 5 million meals to people in need in our community. Gowrie Group believes strongly in giving back to the local community and is committed to help end hunger along the Connecticut shoreline. The Gowrie Group Challenge is Gowrie’s annual matching fundraising initiative to benefit The Shoreline Soup Kitchens & Pantries (SSKP). The 2018 ALICE Report* showed that one in three (30%) Connecticut residents struggle to meet their family’s basic needs each month. ALICE stands for Asset Limited Income Constrained Employed, which is defined as individuals or families who have earnings above the federal poverty level, but below basic cost-of-living threshold. The matching approach of the challenge doubles the impact of generous donations from local businesses and individuals. Contributions are used to fill the shelves of the SSKP’s five pantries and to serve meals at the organization’s nine hot meal sites. Photo (left to right): Ed Gumbrecht (Gowrie Group COO and President), Laura MacLeod (Gowrie Group Marketing Associate), Ellen Rabin (Shoreline Soup Kitchens & Pantries Executive Director), Carter Gowrie (Gowrie Group CEO and Founder), Lindas Dillon (SSKP Volunteer and Gowrie Retiree), and Whitney Peterson (Gowrie Group SVP Marketing). This year’s challenge ran from November 1, 2018 to the end of the year. Gowrie Group kicked off the challenge with a generous $30,000 dollar-for-dollar matching donation. Five local companies stepped forward as Partner Sponsors: LC Doane Company, Tower Labs, BrandTech Scientific, Lenny & Joe's Fish Tale, and Sound Rigging Services. Together, the Partner Sponsors provided an additional $32,500 in matching funds. Two special local events also helped raise funds for the Gowrie Challenge. The first event was the “Black Friday Benefit Concert” held annually at The Katherine Hepburn Cultural Arts Center (The Kate) on the Friday after Thanksgiving. The Meadows Brothers, Ebin-Rose Trio, Moving Target, Lauren Agnelli & Dave Rave, and Carter Gowrie & Friends gathered to play for this special concert which raised $5,739 for the challenge. The second event was the ballet performance of “Ahavah: The Story of Christmas” which was performed at the Morgan School in Clinton, CT. This event raised an additional $5,000 for the challenge. Throughout the year, Gowrie Group and its employees donate time and services to soup kitchens and pantries across New England. Each summer, Gowrie employees prepare and serve a lunch at the SSKP meal site in Old Saybrook. In addition, employees work together to plan and host food drives every holiday season at many of Gowrie Group’s locations including Westbrook CT, Darien CT, Newport RI, Marshfield MA, Annapolis MD and Manchester NH. This past December, Gowrie employees at the company’s headquarters in Westbrook, Connecticut collected and donated over 80 pounds of cereal to the SSKP. Gowrie Group and The Shoreline Soup Kitchens & Pantries are proud of all that they have accomplished in the past 15 years of their partnership. We would also like to thank those who generously spread the word about this effort. Once again, morning radio personality, Bob Muscatel of WLIS/WMRD, updated the community throughout the Challenge from his radio station. Shore Publishing provided a series of print advertisements in local papers across the shoreline. In addition, the E-List provided online advertisement on their website and in their weekly e-newsletters. Gowrie Group. Always on Watch. As one of the nation's Top-50 independent insurance agencies, Gowrie Group provides total risk management services to individuals and organizations with complex insurance needs. Gowrie Group offers comprehensive insurance solutions matched with trusted advice and a commitment to service excellence. Gowrie Group's portfolio of offerings includes commercial, home/auto, equine, and yacht insurance, as well as employee benefits solutions and safety services. The company's 175+ professionals service clients across the US from offices in Westbrook CT, Darien CT, Newport RI, Annapolis MD. gowrie.com | 800.262.8911.